Obvious Business Etiquette to give you an edge. 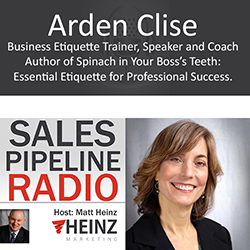 Nationally respected business etiquette coach, Arden Clise is our guest for this episode. She has just published her book, "Spinach in your boss' teeth" available on Amazon, Barnes & Noble and on her site: CliseEtiquette.com . This is a great gift for your team or for you. Many of the tips SHOULD be obvious, but perhaps you weren't paying attention when your mother tried to clue you in. She covers dining, online etiquette, business tips to make your value shine. Her specialty is assisting clients to confidently and comfortably navigate business situations. When is it appropriate to use your digital device in a meeting? Boomers are really bothered by people pulling out devices in meetings, texting, etc. If you are in a meeting, do not pull out your phones in the meeting. Start with that. If you are leading the meeting, set the tone at the beginning of the meeting. "Please put your devices away during this meeting." When you pull devices out, not only do you miss subtle clues and information, it signals to them that the phone is more important than the person in front of you. This should be obvious. It's become a pacifier for people in meetings - something to fidget with. We know some people use it as a note taking device.If you have to use your computer/device - let them know that's what you are doing - taking notes and then ONLY TAKE NOTES - DO NOT get distracted. Use pen and paper - you actually learn it better, retain more AND there is not doubt you are taking notes and not pretending to take notes while checking the game scores or Facebook. When you are using a laptop/tablet to take notes, you are not able to be as present and you miss some of the non-verbal cues. Multi-tasking is a myth. Non-verbal cues can be the difference between building the relationship and wasting everyone's time. On the phone: Without body language cues, we have to rely on our TONE on the phone - a warmer tone - really helps. SMILING while you are talking. It immediately puts warmth in our voices. Sounds corny, but it works. PLEASE JUST STOP saying my name every few seconds - it is SO phony - it makes us cringe. Use the name of the person ONCE perhaps twice, beginning and end, but that's it. Interrupting people. Without body language you can't tell when they are wrapping up. Let them pause and end before you jump in! You will get your chance. A bit of air in a conversation can draw more attention to what you say next. Use that to your advantage. Find out if your guest has food restrictions. No sense taking vegans to a steakhouse. Don't put the decision of "where" on them. Suggest a great restaurant for them after you know their restrictions or preferences. Make the arrangements - make it easy on them and arrive early. Avoid the awkward check grab - have cashier/maître d run card as you're leaving and arrange with server ahead of time. Round table full of settings - which parts are yours, which are your neighbor's? Simple thing to remember: BMW - Bread (left) meal (middle) WATER (glasses on the right). Networking question: Hug or handshake? Ask, "Can I give you a hug?" - let them make a move - if you already know them and have met. ANYONE who has ever wondered how to handle etiquette dilemmas in the workplace. Amazon or Barnes & Noble or CliseEtiquette.com to buy the book. Visiting Arden's site will allow you to sign up for her newsletters, too. You'll have to listen to the full episode and TAKE NOTES.